Finally the new Apple iPad 3 is a reality. Apple CEO Tim Cook released the new iPad, which is going to be available for shipping in global markets next week itself. Apple hasn’t added many new features to the new iPad. Like the iPhone 4S, the company has just introduced some trivial overhauls to the form factor, design, innards and other aspects. But, there is a welcome change in naming. Apple seems to have stopped naming iPads with serial numbers. 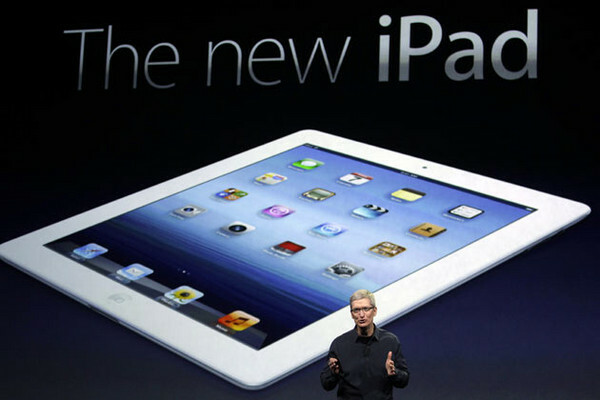 Thus, the 2012 iPad upgrade will be simply known as ‘the new iPad’ and not ‘iPad3’as it was rumored to be. Here we introduce you ten most important features in new iPad. Retina Display: A high resolution Retina display is the biggest improvement in the new iPad. Apple has increased the pixel resolution of the 9.7-inch display to a whopping 2048 x 1536. With 264-ppi and3.1 M color support, the new iPad’s display is brilliantly sharper and brighter. Yes, the new iPad can defy any tablet on earth in screen resolution and clarity. Integration of Apple’s Retina Display technology further adds into its strength. Upgraded processor: Though not the rumored A6 processor, Apple has upgraded the new iPad with the new A5X chipset. The A5X chip is a slight upgrade to the company’s current A5 chip. As per Apple, the new chip can perform four times better than NIVIDIA’s famous Tegra 3 quad core processor. It virtually eliminates the need for a quad core processor. Finally, the new iPad is equipped with a dual-core Cortex-A9 CPU with A5X chipset. The CPU clocks at 1GHz and the device features quad-core PowerVR SGX543MP4 GPU for better graphical performance, however. 4G LTE support: The new iPad is actually Apple’s first product with the 4G LTE compatibility. But, it will work only in theU.S. as other countries are yet to get the high speed network connectivity. In the domestic market, both AT&T and Verizon, two leading 4G service providers and also Apple partners, will get separate versions of the new iPad. In global markets, both GSM and CDMA versions of the new iPad will be available. 4G LTE also increases internet speed manifold. “You’ll be jumping with joy as it pulls down data at speeds up to 73Mbps and allows you to watch HD content on the move or download full albums in seconds,” says KnowYourMobile’ s Tony Crammond. Gaming performance: Thanks to a quad-core PowerVR SGV543MP4 graphical processor, the new iPad will offer stunning gaming performance. The device’s increased graphical intensity and performance make it a stiff rival for Sony’s PlayStation Vita. Wi-Fi hotspot: The iPad can provide high speed internet connectivity for up to five Wi-Fi enabled devices. The feature works with both 4G and 3G connectivity. But, 4G is the most reliable one as it offers better speed. Battery life: At a glance, there can’t be seen any improvement in the device’s battery life. It offers the same 10 hours backup of its predecessor the iPad 2. But, it should be noted that the new iPad has a pick of battery swallowing features like a HD display, 4G LTE and others. So, the new iPad’s battery capacity is appreciable, indeed. 1080p video recording: The new iSight 5-megapixel rear camera and iMovie app ensure better 1080p video recording with the new iPad. It is yet another much-appreciated feature of the 2012 version of iPad. Improved camera: Well, Apple improved the device’s camera with an iSight 5-megapixel sensor. The camera comes with rich features such as autofocus, geo-tagging, IR filter, HDR, face detection and many others. It can capture video at 1080p. Voice dictation: Apple has added a new Siri-style voice dictation feature on the new iPad. It will help you dictate your emails, documents and messages to the iPad. The content will be saved as you speak, which can later be sent as emails, messages and others. Light and portable: Irrespective of the revamped battery and hardware, the new iPad is light and portable. The device features almost the same size and weight of the current iPad2. In other words, it is 9.4mm thick and635 grams weightier.